We were excited to see Michael Lyle’s Las Vegas Review-Journal article, “Spreading the news and views – Podcasts offer another medium for telling people about Las Vegas”, on the front page of this past Sunday’s LIFE section (1/10/16). 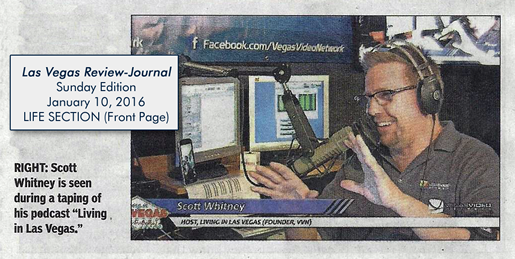 The article opened with a story about Scott Whitney’s 2005 Halloween costume – he dressed as a “podcast” – and continued with quite a bit of information about the Living in Las Vegas podcast, along with several other podcasts about Las Vegas (Downtown Podcast, Five Hundy by Midnight, and Vegas Fanboy). Just got the link to the RJ Article. PodWorx, Inc., is an online broadcasting company that specializes in podcasts, web tv, and live streaming video productions. 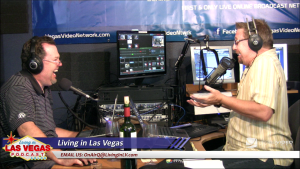 We are Nevada’s most experience live streaming broadcaster and podcast production company. The company, along with our two other businesses, the Vegas Video Network & Vegas Video Co-op, are growing. 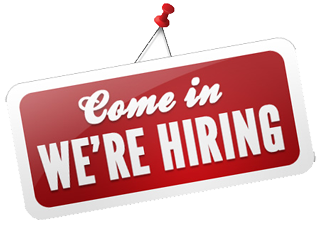 As a result, we’ve created an opening for a part-time, PAID, Production/Studio Manager. We believe this position will eventually be moved to a full-time position. At the Vegas Video Co-op (VVC, your own broadcast and video production studio without the six-figure investment), we help our Members best demonstrate their expertise by providing the equipment, staff, studio, and guidance required to deliver content that improves their bottom line. VVC has produced over 1,200 videos for entrepreneurs, entertainers, and companies big and small. We’re looking for a unique individual who wants to roll up their sleeves, work hard, and get deep into the inner workings of what is arguably the next step in broadcasting and video production. If you’ve ever wanted to get in on the ground floor of this exciting new way of reaching a worldwide audience, this may be the perfect opportunity for you. Sounds interesting? Excellent. You’d be a great candidate if you are personable, well-organized, professional, enthusiastic, and willing to work crazy hours. You should be VERY comfortable around technology — you’ll be helping with. . . Naturally, you are a fast learner with an affinity for all things technical, so regardless of the work you’ll be asked to do, you’ll catch on quickly and get the job done. You should have a creative eye and mind, and must write well. As time goes on, you’ll be expected to do everything from writing show notes to being a technical director for any of the VVN shows or VVC video shoots. In other words, we expect the Production/Studio Manager will be able to run all aspects of the studio. This position will require 16 to 20 hours a week of your time. There will be a mix of morning, afternoon and evening hours. As mentioned previously, we expect this position will become full-time. If you’re confident you’d be a good fit, let us know. Send an email to jobs @ vegasvideonetwork.com. The subject of your email should be “Job Opening: Studio Manager”. If your email doesn’t have the correct subject, it will be ignored. Include your resume, tell us about your technical capabilities/experience, and let us know why you’d like to work with our company. You should have a minimum of 7 years of real-word experience in a film and/or video production environment. In your email, provide a link to your previous work. Please describe your level of experience with video production software (NLE, motion graphics, design, etc.) and equipment (cameras, lights, switchers, etc.). You must have your own transportation and be able to pass a background check. You must live in Las Vegas, as well. The Vegas Video Network continues to add to its highly-curated family of programming with House Seats Presents. Beginning on November 23rd, 2015 the show will broadcast at 3PM PT LIVE from the Vegas Video Network/Vegas Video Co-op studios. Hosted by House Seats founder Bryce Krausman (who also founded the popular DW Bistro), the 30-minute interview program will give an intimate look at each of the performers featured on the House Seats website. House Seats is a Las Vegas based ticketing company with access to complimentary show tickets and offers unique to our city. A House Seats membership turns you into an ambassador of Las Vegas by giving you the ability to take friends and family to great Las Vegas shows. . .at no cost (after membership). As with all Vegas Video Network programming, House Seats Presents will broadcast live and feature live interaction with our online audience. The show will also be available on the “three screens” (television, desktop, mobile devices) as audio- and video-on-demand programming on the network’s website (http://VegasVideoNetwork.com) and through a variety of syndication partners. Welcome, Bryce, to the Vegas Video Network family! The VEGAS VIDEO NETWORK® is the first and most respected online broadcasting network which specializes in insider news and expert views from Las Vegas locals to our neighbors and the world. We develop and produce all-original programming that is predicated on input and participation from our fan base. We are especially close to our worldwide audience because we focus on two key principles — approachability and authenticity. The VEGAS VIDEO NETWORK is a YouTube Partner, available on iTunes, Roku, Livestream, Stitcher, Tunein, Google TV, Apple TV, Facebook, and Twitter. The network is owned and operated by PodWorx, Inc., an Internet broadcasting company that specializes in podcasts, Web TV, and live streaming video productions. 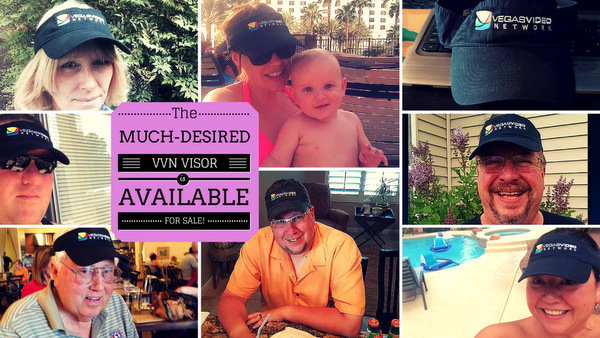 Beginning today, we’re making the VVN VISOR available for purchase. It features the VVN logo embroidered on a black visor. To cover our costs to have them manufactured, shipped to us, and then shipped to you (US only), we’re only charging $17.95. Order yours today! And don’t forget to send a photo of you with your new VVN VISOR! We’ll include it in our gallery during the HADOM segment of Living in Las Vegas. Given the advanced age of our hosts (that would be Brett and Scott), we’ve decided to move the start of each week’s Living in Las Vegas LIVE STREAM from 8PM PDT to 7PM PDT. This will begin on June 16 and continue thereafter. WHOOPS: Looks like we’re going to have to go back to 8PM AFTER THE 6/16 SHOW. SORRY ABOUT THAT. OK, Ok. Now we got it. LiLV starts at 7P PT.